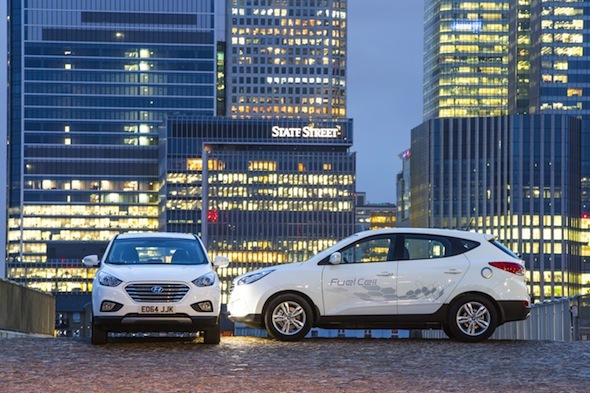 Hyundai has launched the UK's first mass-production hydrogen vehicle in the form of the ix35 Fuel Cell crossover. It's available to buy now, priced from £53,105 after a £14,880 government grant. Fulfilling its promise of bringing fuel cell vehicles to the mass market by this year, the ix35 was initially leased to fleet operators, but now has gone on sale to private motorists. One of a number of manufacturer forays into sustainable mobility, hydrogen fuel cell vehicles combine the gas with air in an on-board generator to produce electricity to power the wheels, with water being the only by-product. Unlike battery electric cars, which have been adopted by rival manufacturers such as Nissan and Kia, hydrogen vehicles get around the problem of 'range anxiety', as the process of refilling a hydrogen tank takes around as long as refueling a conventional petrol car. Hyundai claims that the ix35 Fuel Cell can cover up to 369 miles on a full tank and offers a similar driving experience to a conventional ix35, with a 0-62mph time of around 12.5 seconds and a top speed of 100mph. However, early adopters may find filling up a bit of a problem, as there will be only five publicly accessible hydrogen filling stations open by the end of the year, and they're all in London. However, expect that number to increase in the near future, as the government has earmarked £11 million of extra funding to expand the network nationwide.